In the late '50s, Harley Brown, fresh out of art college, had a small booth at the Calgary Stampede where he tried desperately to hawk his Elvis on velvet paintings. The early days were lean for Brown, who admits to begging people to buy his work. "I even changed my name for awhile thinking Brown, who is going to buy a Brown?" said the artist. "But this is where it all started for me: the Calgary Stampede." On Wednesday, Brown and Stampede officials unveiled one of the artist's proudest accomplishments in his storied career -the 2012 Calgary Stampede centennial original artwork, which will be reproduced on more than 30,000 posters. Entitled the Vision and the Dream, it's a breathtaking piece of art featuring the Stampede's founder, Guy Weadick, who 99 years ago launched what would become known as the Greatest Outdoor Show on Earth. In addition to a handsome portrait of Weadick, the painting shows an eager-looking, beaming young boy about eight years old, decked out head to toe in cowboy duds. 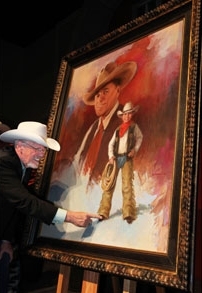 His eyes are looking off the canvas, to help illustrate the Stampede's next 100 years, Brown said, adding he scrubbed the canvas clean many times to get the boy's face just right. He worked tirelessly on the piece for "months," Brown said, noting that creating a perfect portrait of the legendary Weadick was challenging. "When I do a portrait of somebody, I have to feel the heart pumping, and with Guy Weadick I finally felt that he was alive and his heart was beating and I put down that last stroke," said Brown, who was born in Edmonton and attended Alberta College of Art & Design in Calgary. "But you have to wait for that person to come alive." Stampede president Mike Casey, is pleased with the painting, saying he wasn't sure what to expect when he asked the artist to come up with a centennial piece honouring the past and anticipating the future. "Harley captured it so well," he said, adding that including Weadick was important and the young boy stirs up feelings of hope. "It makes me think of a little fellow standing at the gates of the Stampede saying, 'This is my dream.' "
Brown's artwork will be auctioned off on July 14. As for the identity of the boy in the painting, Brown says that will remain secret. "That's the biggest secret of all, never to be divulged." The Calgary Stampede Western Art Auction Committee is pleased to announce that Harley Brown is the inaugural recipient of the Outstanding Artistic Achievement Award. This award was created by the Committee to recognize an individual whose exceptional artistic accomplishments and their contributions to western art are highly regarded in the international art community. This award will be presented to Mr. Brown at the 30th Annual Art Auction to be held on July 14, 2011. Harley Brown was born in Edmonton, Alberta, Canada in 1939 and grew up in Moose Jaw, Saskatchewan. He attended the Alberta College of Art in Calgary, Alberta, and lived in this city for over 30 years, honing his artistic skills. In 1964, Harley moved his family to London, England to attend the Camberwell School of Arts. In 1973, he had his first one man art show in Helena, Montana, thanks to efforts of Bob Morgan, the Curator of the Historical Society. In the 1990’s, he moved with his wife, Carol, to their present residence in Tucson, Arizona. In addition to Harley Brown’s artistic focus on portraits of the people of First Nations, he also completed a commissioned portrait of Sir Winston Churchill in 1965 and several years later received commissions to paint portraits of President Ronald Reagan and other well known world celebrities. He has received numerous awards and gold medals for his outstanding art work including the prestigious Robert M. Lougheed Memorial Award in 1990. From 1980 to 1999, Harley instructed at painting workshops around the world. In 2005, he was invited to be a member of the Cowboy Artists of America (CAA) and he is also a member of the Cowboy Hall of Fame, the Autry Museum in Los Angeles, Northwest Rendezvous and the Tucson Seven. Harley is an annual exhibitor at the Prix de West Invitational Exhibition and Sale and he regularly contributes to the International Artist Magazine. He has published three books with the most recent being, “Harley Brown’s Inspiration for Every Artist”. He established the Harley Brown Scholarship Fund to support deserving students who wish to attend workshops at the Scottsdale School of Art in Arizona. Harley Brown modestly considers himself to be a “fair” jazz pianist and his story telling abilities are beyond reproach. The Calgary Stampede Western Art Auction Committee is honoured to be able to present the Outstanding Artist Achievement Award to Harley Brown, a truly gifted artist and humanitarian. Another great honour for Harley following his induction onto the CCI wall of excellence last year. We are all very proud of Harley and consider it a priveledge to know him!